Darlington Cycling Campaign today called on residents to back their local council’s attempts to improve the safety on the streets by getting out of their cars and walking or cycling instead. The appeal comes in the wake of the findings of a major survey into transport patterns and perceptions, which clearly showed that cycling could replace many unnecessary car trips in the town. But the survey also revealed that 82% of those questioned think that cycling in Darlington is dangerous. “The people of Darlington feel in a Catch 22 situation”, said Richard Grassick, chairman of Darlington Cycling Campaign. “But the only way cycling will be safer is when the number of cars on Darlington’s streets is reduced”. The Town on the Move travel summit, which concludes today (Thursday) in Darlington’s Central Hall, was told by Werner Brög, who authored the 4,500-strong survey of Darlington residents, that the £3.24million won for the project is a once-only opportunity to solve Darlington’s traffic problems. Mr. Brög interviewed a representative number of households in Darlington about their expectations, perceptions and hopes for the development of transport in the town. 94% said they were against an increase in car traffic, but at the same time they expected that that will happen. 53% think that walking in Darlington is rather risky, and even 82% think that this is the case for cycling. All in all, said Mr.Brög, 50% of car trips could be replaced by another choice of transport like bus, bike or feet. And whilst there is a clear need to improve the reliability and comfort of the town’s buses, most unnecessary private car trips – those under 1 km – could be done by bicycle or walking. But he said repeatedly that Darlington should put a stress on developing cycling. Cyclists currently comprise just 1% of Darlington’s traffic, compared to a typical European figure of 20%. The German transport expert cited the Austrian city of Graz as an example of what could be done to improve road safety and encourage more people to walk or cycle. After reducing the speed limit in the city’s central zone to 20 miles an hour, child fatalities fell to zero. Mr. Brög was backed up by Ryland Jones, who spoke at the summit on behalf of Sustrans, and argued for traffic priority measures in favour of the cyclist. “Clearly safety is a paramount issue for people who might otherwise leave their car at home”, said Darlington Cycling Campaign chair Richard Grassick. 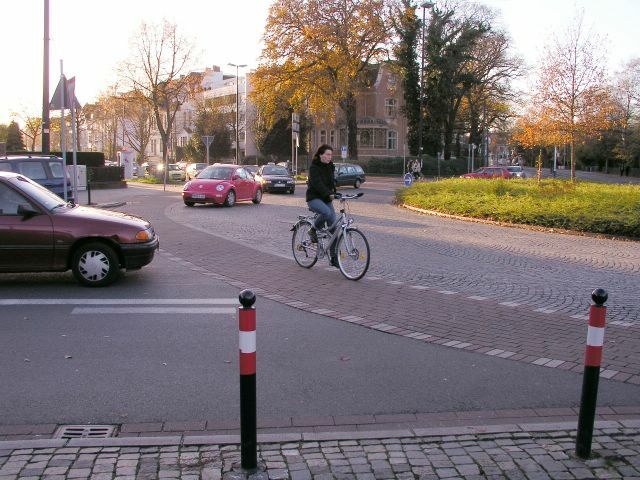 “Bold measures, such as the Graz scheme, may be needed from the council before people feel safe enough to try walking or cycling. Once people feel that the town’s streets are geared to cyclists and pedestrians rather than cars, there will be an unstoppable momentum towards sustainable transport”. Our next meeting will be at Wed, the 20th of April 2005, 7pm at the Red Lion, Priestgate, upstairs. 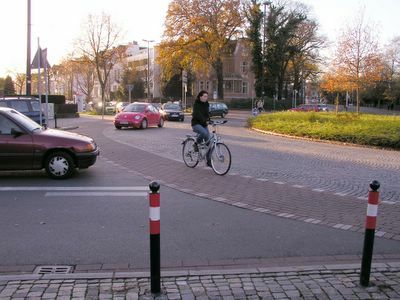 Imagine Cycle Heaven in Darlington..A roundabout in Bremen, Germany with full cycle priority at every entrance and exit. As discussed at the meeting tonight (more later), I’ve set up a Google group, so we now have a new place to discuss cycling in Darlington: Google Groups : Darlington Cycling Campaign. Come along, sign in and introduce yourself. The next public meeting of the Darlington Cycle Campaign takes place tonight at 7pm in the Red Lion (upstairs room), Priestgate, Darlington. All Welcome.